Why did What Remains of Edith Finch win Game of the Year? 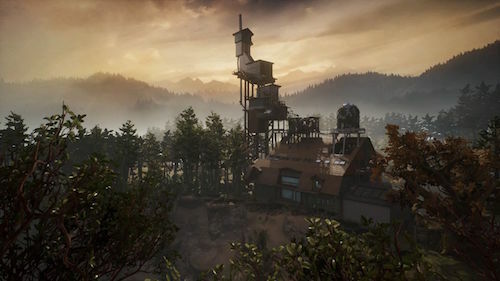 In 2017 and 2018, the game What Remains of Edith Finch won several awards. 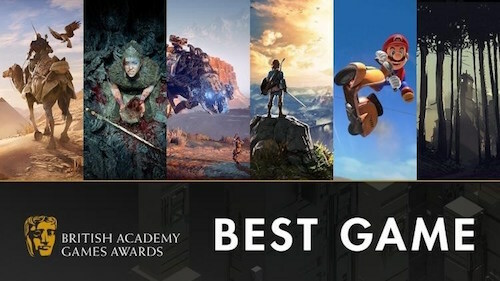 These include Best Narrative at the 2017 Game Awards in Los Angeles, and the award for Innovative Narrative at the South by Southwest Game Awards in Austin. It was also nominated for a host of other categories as well. However, perhaps most surprising, at the 14th annual awards show hosted by BAFTA, the British Academy of Film and Television Arts, What Remains of Edith Finch won the coveted Best Game award for 2018. Part of what makes this award particularly significant were the other contenders for this year’s competition: Super Mario Odyssey and The Legend of Zelda: Breath of the Wild. Both of these games are major entries in longstanding series with well-established player-bases that are critically acclaimed and wildly popular in the gaming community. And yet, when the time came, neither of these games won the Best Game award. The announcer even says, “Amazingly,” before he announces Edith Finch as the winning game. Even the director of Edith Finch was taken off guard by the award as well. As he said, he clearly expected one of these other two games to win game of the year. In fact, he comments that he had prepared a speech for all the other categories except the main Best Game award. So, what happened? How could a small, quick, little story game like this win an award so big among this caliber of competition? Here are five reasons why I think What Remains of Edith Finch won the BAFTA award for Best Game in 2018. 1. The Quality of the Story. Most of your time in the game is spent from the point of view of a young woman named Edith Finch as she returns to her house she grew up in to piece together what became of her family. However, the game actually begins from the point of view of someone else. While the identity of this person is obvious after the game is complete, it is not immediately clear at the outset of the game. In fact, after the first few moments of the game, it’s easy to lose sight of these few orienting frames. During the rest of the game, you play as Edith and then as you explore the memory or history of each Finch family member, the point of view shifts to a different person. Through a strong voiceover narration, though, Edith still anchors the player’s perspective, giving a cohesive experience throughout very different gameplay experiences. All of this to say, there are several rich narrative layers introduced into the structure of the game’s storyline that you encounter as you play. You begin by seeing a young child holding a journal and flowers on a ferry. The child opens the book and starts reading, prompting Edith’s dialogue. At this moment, you immediately transition to Edith’s point of view walking toward the house. Later, once Edith herself eventually encounters a memory of one of the Finch family members, the player transitions further into that person’s past. At the climax of each shorter episode, the transition back to Edith’s point of view is typically to pan out to Edith holding the object that prompted the memory, her putting the object down, and then her making a sketched entry in her journal. With this device, we are able to see Edith fill out her family tree. As Edith makes these sketches, the player is also able to see how far they have progressed in the game and in the story. As Edith is recording each of her own stories in her journal, the player eventually realizes that what they have been playing/watching has been Edith’s own entry in that same journal. This of course is one the dramatic twists at the end of the game’s storyline, but it also skillfully ties together many of the threads that are explored earlier in the game. Edith has been recounting and interpreting these stories in her journal; and it turns out, her own story is part of this short story collection. You as a player realize that the narrator you’ve been following is part of the narration. Your interpreter must now be interpreted. The small narrative arcs that you play through with Edith produce a creative tension that gives you a bit of forward momentum as you walk through the house alone. This series of stories within a story set within a broader story setting gives the game a layered narrative richness. 2. The Depth of the Themes. A second strength of this game is the depth of its themes. As the individual stories unfold and as the broader storyline plays out, several deep and distinct themes emerge. The most pervasive theme in the game is death. After all, each of the memories that Edith recounts and the episodes that you play through end in the death of the main characters. 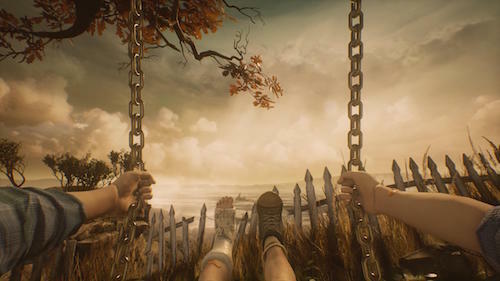 Much of the imagery of the game also reminds the player of death and the memory of death. From the mini-memorials that Edith’s grandmother sets up throughout the house, to the gravestones outside the house, to the sketches Edith makes in her notebook, the player is constantly prompted to contemplate mortality. While this may sound overly dour, each episode has a voice and character of its own. Sometimes the mood is light, sometimes dark; sometimes comic, sometimes tragic; As varied as the lives and personalities of each of the Finches Edith recounts are, so too are the accounts of their deaths. Through these diverse stories, the theme of death is deepened and developed. Not only the theme of death itself, but also highlighted here is the ever diverse responses to these deaths by those around them. This particular aspect is an example of how a primary theme of the game branches off into several sub-themes. Death reaches into each corner of the Finch house, but that dark reality casts its shadow differently from room to room and from life to life. Within this minor key, several subthemes contribute to the game’s thematic orchestra. Family dynamics. Loneliness. Fear. Relationships. Addiction. Happiness. Abuse. Marriage. Divorce. Psychology. Religion. Doubt. Faith. Mystery. Blessing. Curse. Beauty. Grief. Guilt. Memory. Maybe even Magic. These types of subthemes are interwoven into the brief but gipping stories of the Finch family as they experience and respond to the vagaries of life and death. The depth of these themes gives the game a strong reflective quality. 3. The Web of Inter-connections. In numbers 1 and 2, we saw the quality of story and the depth of themes. In 3 and 4, I want to explore not just the presence of these aspects but the function of these features within the game. 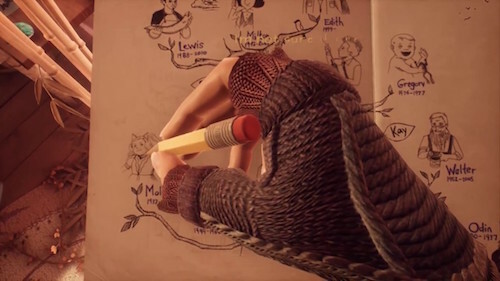 As you play through What Remains of Edith Finch, you experience a web of inter-connections. Some of these are visual and literary interconnections between the scenes that you play through. Physically, these are visual connections between rooms or places on the property you have been. As mentioned in #2, though, each of these spaces and places are embedded with story and thematic content. So, a well-placed visual becomes a reminder not only of a different room but of an entire story and that story’s overarching theme. Some of these connections are obvious. Some of them are signaled by the voiceover narration and demarcated by the words that suddenly materialize in many of the scenes. Some of the connections, however, are subtle and only bear significance after playing later sections of the game. The opening sequence of the game illustrates the web of interconnections that await you when you play the game. The first thing you see is the child holding Edith’s journal with the flowers in his hand. This child and Edith represent two layers of the story and the gameplay. 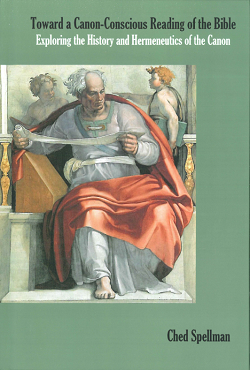 The child’s hand and the cast on his hand represent one of the first visual connections between these two layers. As the player, one of your first actions will be to directly reach for the journal as the child, placing the hand in your direct field of vision. As Edith’s point of view begins, you will walk toward the house and see a mailbox. One of your first actions in this part of the game will involve a prompt to open the mailbox, once again placing a hand in your direct field of vision. This time it’s Edith’s hand, and her right hand is covered by her sweater in a similar way that the child’s hand is covered by a cast. This visual echo of physical detail and physical movement creates an interesting bit of resonance between the two scenes. This subtle visual connection is of course echoed at the end of the game as the relationship between that child and Edith becomes paramount. The relationship between these two hands is no longer inferred by the player but directly asserted by the story. 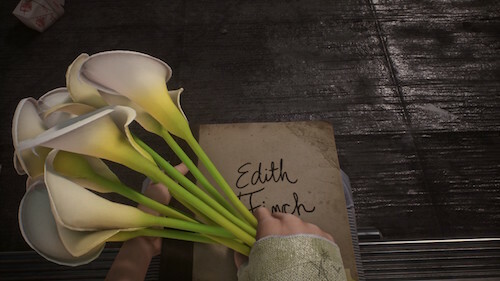 Furthermore, those flowers we saw the child’s hands holding return at the end of the game after the big reveal, and now they are laid at the grave of Edith herself. 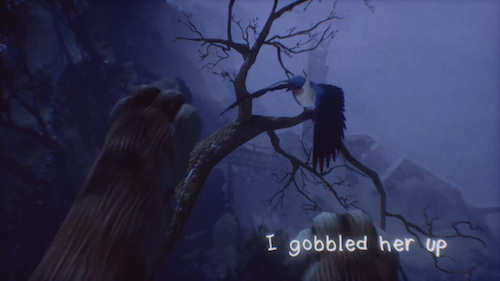 So, right there at the beginning of the game, the first thing you see as a player are striking visual images that capture the core themes that the game will go on to explore at length: death and the relationship between Edith and the family members that she can only communicate with through memory and the written word. Another image you see straightaway on the path to the house is a large deer. You come upon this buck right in the middle of the path. The deer looks at you and then runs off into the woods. This visual encounter also introduces a major theme of animal life that runs throughout the game. Toward the middle of the game you play as Edith’s grandfather Sam, on a hunting trip with Edith’s mom, where the entire episode revolves around hunting a deer. Finally, one of the last sequences where Edith recounts the memory of her grandmother’s vision, there is an image of the same buck that Edith sees on the path at the beginning of the game. By this point in the game, this image echoes both the memory of the grandfather’s hunting trip and also the opening sequence of the game. This type of connection is direct and difficult to miss. Some connections share a similar mechanism but are more subtle. For example, early in the game, you explore a brightly colored pink bathroom. One minor detail of this scene is a small rubber green frog sitting on the vanity beside the sink. If you have played through the rest of the stories, you know this foreshadows one of the most disturbing accounts in the entire game. The placement of this type of simple detail is one strand of the web of connections that makes the game feel rich and full. The first time I played the game I didn’t even really notice this little hopper; on my second time through, It’s all I could see when I walked into the room. Whereas before, all I heard was thin narration and awful interior design; With eyes that had seen the rest of the Finch home and heard that part of the Finch story, now, that little water closet was fraught with background and loaded down with emotional weight. 4. The Blend of Gameplay with Story and Themes. Something that enhances the experiences of playing this game is the way the story and the themes blend with the gameplay mechanics. In each episode, you encounter different types of movements and gameplay elements that you have to figure out in order to move the game forward. These aren’t overly technical and none of the mechanics are difficult. However, they are different enough to make you concentrate. As a player, by the time you figure out what you’re supposed to be doing with your controls to open a door, slide a hook, turn a crank, or grab a ladder or a tree branch, you’re already moving on to the next bit of the story. Typically, once you have figured out a transition mechanism, you trigger the next part of Edith’s voiceover narration. In each story, you take the perspective of a different person at a different life stage. Sometimes you’re an infant, sometimes a child, sometimes a teenager, sometimes an elderly woman, and in one case, a collection of animals. The quick shifts to new characters give freshness to the story but also keep you engaged as a player. Though you essentially are simply walking through the Finch house for the duration of the game, it feels like a varied and wide-ranging journey. These transitions are interesting, but it’s within the stories themselves that this feature truly comes into focus. In order for the story to continue, you as the player must set certain actions in motion. In each of the stories, the unique gameplay element blends into the account that is being enacted. This technique engages and draws you into the story. This also feature showcases one of the ways that video games can tell stories that other mediums cannot: interactivity. You yourself are tasked with carrying the story along. Your movements have meaning, even if you are not changing the content of the story. The fact that you are participating in the forward momentum generates an effect and impacts the way you experience the story. Sometimes this movement is delightful, and you do not want it to end. Sometimes this movement is disturbing, and you don’t want to have to do what you know you have to do to move the story along. Sometimes this movement is repetition, and you are not sure where it will lead to next. Sometimes this movement is confusing, and you are not quite sure where to go. Sometimes this movement is mesmerizing and monotonous, and you find yourself getting pulled into another dimension entirely. Let’s briefly look at the way story, theme, interconnections, and gameplay blend in one of these short stories. The first story Edith explores showcases some of this interplay and sets the expectations for the rest of the game. Up until this point, you have been exploring the outside and inside of the house, hearing Edith’s voice-over narration, but with Molly’s story, the game is on! At this moment, you as the player have become the cat. You control the cat pouncing across the branches outside the house in pursuit of the bird; You get closer to the bird, but Molly’s narration draws you back into the uneasiness of her story. Is this Molly’s imagination, or is she really outside climbing the tree? She mentions that she was now in the big tree where her Dad had told her not to climb, but all she could think about was eating that momma bird. As a player, this creates a baseline tension that shows up in each of the stories. Molly’s sweet narration clashes both with the fact that we know she dies at some point (does she fall? You might suspect other causes: does she die of hunger? Does she die of food poisoning?). You then soar around for a bit, but then you must soon pounce and kill a rabbit. Then, suddenly you are rolling down a mountain as a shark. You finally plunge into the ocean; Now with a different set of controls, you must swim and hunt the seal and kill and eat it; you then turn into a slithering snake creature that now hunts, kills, and eats a boat full of sailors! This feast does not satisfy Molly at this point though; she’s only more hungry; She smells something across the water, and you quickly realize that what the monster has smelled is Molly sleeping in her bed. The monster finds an opening through some pipes to enter her own bedroom through the bathroom toilet where Molly had just eaten the toothpaste. You’re now back in Molly’s room, where you slither over to her sleeping in bed. At this point she wakes up and the dream ends. As the nightmare ends, Molly finishes her diary entry recounting this vivid tale of a hungry child. As Molly’s diary entry comes to a close, this becomes the seamless transition sequence back to Edith’s point of view, and you see Edith sketch Molly’s name, date of birth, and date of death in her journal. In this brief dream sequence, the player shifts gameplay mechanics several times, plays as several animals, and must quickly adjust to a variety of different moods and atmospheres. The entire sequence mimics the stream of consciousness of a dream state, with the underlying theme of hunger. As you play these wildly different animals and scenes, you quickly try to figure out what ties them. You realize it’s eating and insatiable hunger: in each scene, Molly imagines that she is on the hunt for something to eat. Anything to eat. This of course echoes the opening scene before the dream starts. This theme also anticipates a tension that features throughout each story and through the larger story as a whole. The sense that something is not quite right. On the one hand, Molly’s story is light hearted and enchanting. Rabbits, owls, animals, the outlandish dreams of a child. It’s all delightful and intoxicating. But it’s also jarring as you play through the sequence and begin killing the prey; and as you think about this question, Why is Molly so hungry? Molly eats the gerbil food, the toothpaste in the bathroom, and plastic berries from the bathroom decorations. She’s hunting anything she can around her room. As she says, “I ate a lot of things that night.” Her door is also bolted shut. Why is she locked in her room? Why hasn’t she eaten? Why has her mom sent her to bed without dinner? Taken by itself at the beginning of the game’s story, these details might have a positive interpretation. The tragedy coming is an accident? There is nothing sinister here. Or is there? In light of the game’s continuation and Edith’s exploration of the rest of the house, we can see in Molly’s story the underpinnings of the deeper and darker themes that we will soon encounter in the game. Something is not quite right here. That much is for sure. But what is it? We need to keep exploring. Edith must keep going if she wants answers. And, now, at this point, you as the player must keep going if you want answers as well. This window exit and bit of dialogue is a good example of how the game is constantly reminding you of the web of interconnections that you’re entangled in as you explore the Finch home. You move back and forth in time. Back and forth in Edith’s memory. And back and forth around the house as a player. The initial story about Molly prepares you as a player for the rest of the game. After playing this otherworldly section, you are ready for just about anything. This blend of gameplay with the story and themes is memorable and easily one of my favorite parts of the game. I think this particular aspect is one of the ways that Edith Finch transcends other games in its category and leads into our final point. 5. The Lingering Effect of the Gaming Experience. The final reason why I think What Remains of Edith Finch won Best Game in 2018 is the lingering effect of the gaming experience. 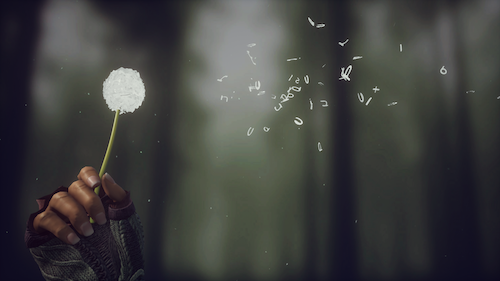 In the final analysis, what remains of What Remains of Edith Finch is the effect it has on its players. If you read user reviews of this game, you’ll typically read anecdotes. In addition to people talking about the game itself, you’ll also hear people telling about themselves. Something about the story of this game prompts players to tell their own stories. First, they’ll tell about how they were playing the game and which parts impacted them the most. But, second, you will often hear them tell further stories about their own life. Something about playing through these stories evokes strong associations with the lives of the people playing the game. This is no accident. It is through the (1) quality of the story, (2) the depth of the themes, (3) web of interconnections, and (4) the blend of gameplay that pulled these elements together that created this type of experience. This, of course, is the most subjective aspect of this whole discussion. Everyone experiences art and media differently. But, for many players, playing this game will be an experience that will linger with them. It may at first seem like this is the case only because these stories are personable and various people will connect with different stories in unique or special ways. Perhaps a particular story will resonate strongly with someone. They experienced something just like that, for example. While this is almost certainly true, again, I think that it is the carefully crafted story, gameplay, and the tight interconnected pattern of themes that has achieved this effect for most players. The game as a whole has a way of making these touchpoints with a wide variety of people but also drawing those experiences together into a shared experience for those who have played the game. What Remains of Edith Finch allows you to explore the stubborn beauty of life and the relentless mystery of death with Edith as she seeks to understand the curse that seems to rest upon the Finch family. In her pursuit of meaning, you are drawn into the quest. You imperceptibly begin to ask these same questions yourself as you invariably detect touchpoints with certain aspects of the characters you encounter. How has death touched you? How have you responded? How do you grapple with this reality? The message of the game is not overly didactic. Edith does provide a voiced narration at the end of the game that gives her perspective on the deaths that she has recounted. And, throughout the stories, she has made comments that have sought to make sense of all that she is remembering. However, as mentioned before, there is a meta-structure that bookends Edith’s point of view. The bulk of the gameplay and all of her voiced narration itself is one of the stories in her own journal. This leaves you the player at the end of the game standing over Edith’s own gravestone, placing flowers at her grave, journal in hand. There you stand. The house, the graves, the story-world of the game in front of you. In your hands is the journal that contains a narrative framework that “houses” the memories and stories that are represented by the stones and structures before you. Edith’s point of view has given you an interpretive framework for understanding death, life, sorrow, grief, and the nature of endurance in the face of inexplicable hardship. The genius of the game’s design is that these questions linger with you as well: What will you decide?